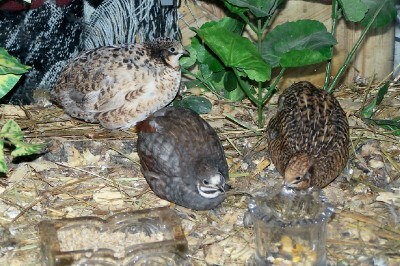 Danna Quail, Benjamin Button Quail, and Abiquail. 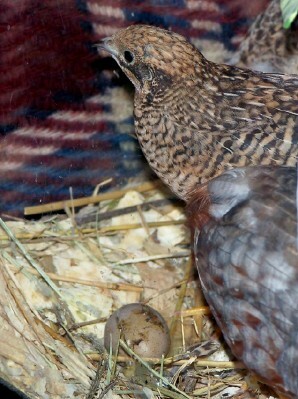 As of September 2014 We are down to one little tiny male quail. But he has learned to make the call of the cukoo clock, the cat, the telephone, Dennis' music synthesizer, and the alarms on the appliances. He waxes forever hopeful that one of them will be the love of his life. 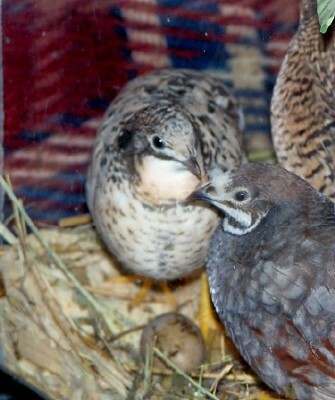 No name on this fellow - he was to have been a mate for Dan Quail, who passed in May of 2014. They have delighted and surprised us with their longevity. Lonely, though it may be. 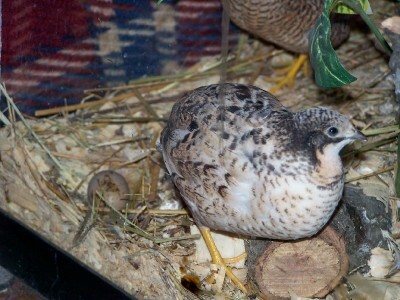 Ms. Abiquail, our little mother. 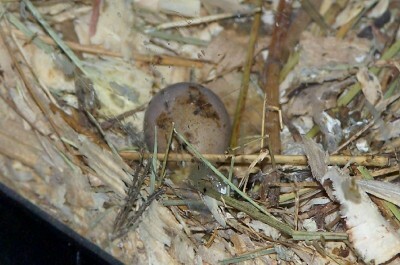 The large white egg in the upper right hand corner of the eggs picture is a grade A Large USDA from Reasor's. 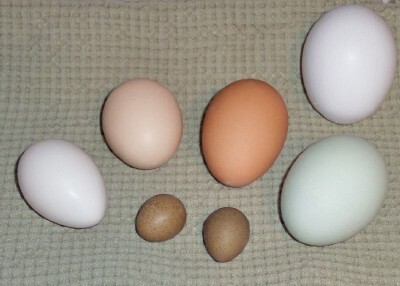 The other eggs are from our own flock left to right: two bantam eggs, one red egg from a mixed breed hen, and a green egg from an Araucana hen. 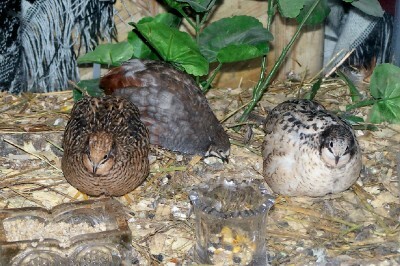 The two tiny eggs in front are perfectly edible Button Quail eggs from Danna Quail and Abiquail. 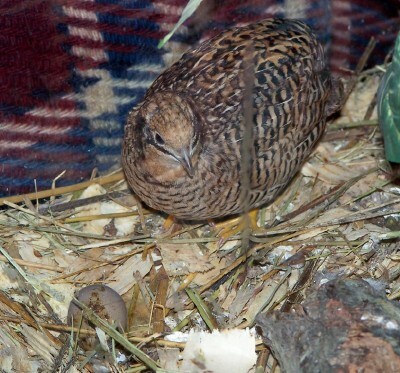 August 17th, 2011, It looks (or SOUNDS, rather) as though Abiquail is going to be a mother soon. 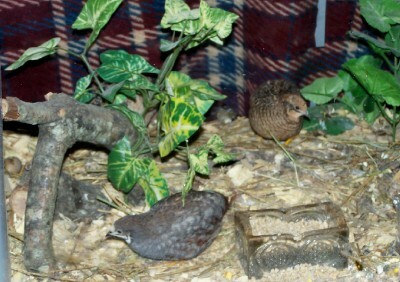 The two adult Button Quail are singing their songs, but from inside the eggs more voices can be heard. Our animal friends comprise a big part of every day, and give us inspiration for our creative impulses. We have currently two Llamas: Magical Flag and Sir Charle; two dogs: Nymphadora and Alexander; seven cats: (Dusty in memoriam), Xena, Roger, Millicent, Whiskers, Samuel A. Cat, Oley, Ubu Roi, Ginzu disappeared...; ONE Turtle, Soup (Grendel took another powder this fall, but he always turns up eventually); Seven guineas; Chickens: Foghorn Leghorn, Peache, May, Raven, Sgt. Pepper, Amelia, Mrs. Bankhurst, one little grey hen, and numerous others...; Two Button Quail; Two Ducks; Seven koi and goldfish; Two newts: John Cleese and Isaac Newton; and two brine shrimp. This also keeps us off the streets and out of the bars, as it were.